If drifting across the High Plains, Storrie State Park might be a worthwhile stop. Unless you are a geologist, however, Storrie is more suitable as a stopover than as your ultimate destination. The park offers some excellent recreational opportunities, but the range of its activities and limited scenery would likely not warrant an extended stay for anyone who does not live locally and use the park as, more or less, a summer home and place to park the RV, or for a weekend getaway centered on water sports. For a state park, Storrie does not have much land- it claims just over 80 acres- but the lake surface covers 1100 acres, and water is the main draw to the park. Fishing, all kinds of small boat sailing, and windsurfing bring the most visitors to this New Mexico state facility along the old Sante Fe Trail, just a good bike ride away from Las Vegas. Windsurfers flock to the spot nearly year round, as do anglers, who appreciate the periodic stocking of rainbow trout, German brown trout, catfish and the common crappie. Storrie State Park is a no-frills facility on all counts. The grounds feature about 50 campsites, half of which have electric and water, but all of which are located rather near the highway. Flush toilets are scattered about. Several dozen grills dot the landscape like lonely cacti; picnickers can find tables and a few party shelters, but those who wander off looking for the concession stand will need to keep walking until they hit the next big park. Migrating waterfowl, such as ducks and Canada geese, enjoy the lake as much as the human swimmers. Birdwatchers report sightings of red-winged blackbirds, falcons, doves and burrowing owls, osprey and hawks. Mule deer and cottontail rabbits hop around now and then. You’ll also see porcupine, raccoon and coyote. 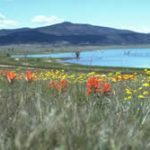 The walking trails weave through typical High Plains vegetation, including sagebrush and cactus, yucca and colorful wildflowers, sunflowers, thistle, snakeweed, locoweed and prickle pear. Leaves are never a problem at Storrie Lake State Park: it has no trees. Storrie attracts studious geologists and skilled rock hounds, but even amateurs can take their whacks on fossil hunts, using common tools such as screwdrivers, hammers, and chisels. Much of the rock in the Storrie Lake vicinity dates from 70 to 600 million years ago. During the Tertiary period, roughly 70 million years ago, the bedrock of the Great Plains was forced upwards. The loftiest points of the lifts formed the Rocky Mountains and the Sangre de Cristo Mountains, the foothills of which jut up just a mile or so from the lake. The cataclysmic activity exposed vast regions of shale and limestone. Although the area is now more desert than wetland, the region, once an inland sea, is notable for its bounty of embedded marine fossils, including shark teeth, now extinct, prehistoric ammonoids, mollusks and various clam-like critters, gastropods and cephalopods, any of which would be quite the souvenir of your expedition. Virtually any exposed cut of Pierre Shale in the vicinity can yield a nice fossil. Storrie State Park is, in the end, a place for people who live relatively nearby to camp, picnic, fish, water ski, windsurf, do some rowing, sailing, biking and walking. Vacationers passing through looking for an additional spot to stay on the way to a more elaborate attraction might find Storrie State Park of interest, too.